South of Fisherman's Cove lies the Ideal Beach Resort. We spent one night at this hotel. 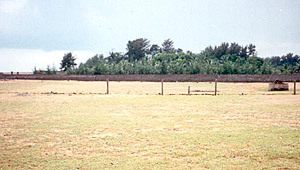 The gardens were full of various species of palm tree; the surrounding area is one of sandy open areas (right) and small lakes and paddyfields. This was the first and only place I slept under a mosquito net, although I saw only one mosquito. The first place I checked was an adjacent sandy grass area. This held House Crow, Laughing Dove, Common Myna, Black Drongo, White-throated Kingfisher, White-browed Wagtail, three Yellow-wattled Lapwings and a Eurasian Kestrel. A Hoopoe flew low overhead, soon followed by another, and both settled on fence posts a few metres away. The bushes edging this area held a female Purple Sunbird, Indian Rollers, and a Red-vented Bulbul. Just across the road from the hotel entrance was a small pool. Here I had a close White-breasted Waterhen, and overhead, one Ashy Woodswallow, six Indian Pond Herons, one Purple Heron, two Grey Herons and a Little Egret.